This Italianate Venacular was built in 1880 for B.W. Brodnax, son-in-law of Charles R. Slaughter, on a small lot retained from the sale of the Wilson lot to the left. This larger original lot was once known as 'Aunt Mary's cow lot' attesting to the earlier rural flavor of Garland Hill. This was home to the Thomas Davis family through the mid 20th century. 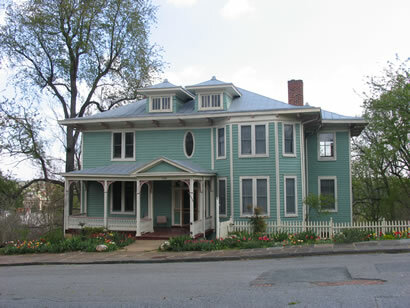 It was also a recipient of the Lynchburg Historical Foundation Merit Award in 1986 for exterior renovation.